in our efforts to keep expand our range of "everyday" recipes while keeping the prep and cooking time to a minimum to accommodate our busy schedule, we've recently subscribed to "everyday food" which is published by martha stewart living omnimedia. now i know it's fashionable to be a martha hater, but i have to admit that this book lives up to it's billing and each issue comes chock full of delicious and easy to prepare recipes - most of which can be prepared and cooked in under 40 minutes. warning - these pancakes are rich! 1. in a medium bowl, whisk ricotta, granulated sugar, eggs and orange zest. whisk in flour until combined. 2. in a large skillet, heat oil over medium-low. add batter, using only 1/4 cup for each pancake. cook until browned, 4 to 5 minutes per side. 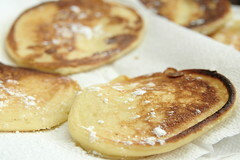 serve hot, dusted with confectioners' sugar. Damn you and your delicious-looking picture complete with recipe and prep instructions! Guess I'll be adding a few things to next week's grocery list.